This professional grade grout features unsurpassed stain resistance with no sealing required. Its Single Component® formula is ready to use, color consistent and easy to spread and clean. Fusion Pro® is also available in the Designer Series. Each of the eight mineral-inspired colors feature reflective color accents that enhance any tile installation. The Fusion Pro® Designer Series provides all of the advantages of Fusion Pro but with additional beauty. CEG-Lite and CEG-IG make up CUSTOM’S epoxy grout system. Both products use a common part A composed of hardener and color pigment in any of our 40 grout colors. Part B is the base which is unique to each product. The CEG systems are ideal when high performance is the #1 demand. 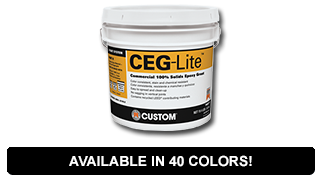 CEG-Lite is light weight and highly resistant to stains and chemicals. CEG-IG is ideal for the most demanding applications like commercial kitchens, industrial settings and other harsh environments. Formulated with CustomLite® Technology, CEG-Lite is also the first lightweight epoxy grout that contains recycled material, contributing to for LEED certification.